This is a nice way to consume oats if you don't like having it with milk like me :).And not to mention it is a very healthy breakfast which is very filling..so go ahead and give this a try. Wash and soak the urad dal for 4-5 hours or overnite as I did. Soak the oats in water for about 10min before start. Grind together the dal,oats,ginger piece and green chillies. Add water so that the batter should be like normal dosa batter. Heat a non-stick tawa.Put some oil on it. 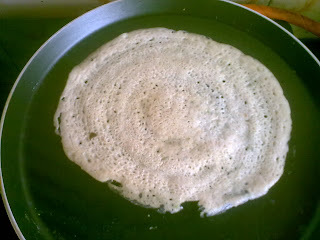 Put a laddle-full of batter in the center and spread it in circular motions to get a thin dosa. Add some oil on the sides and over the dosa. Flip on the other side. 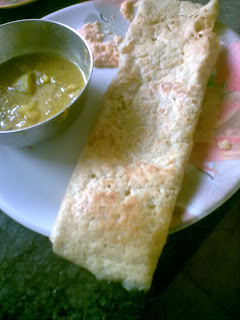 Keep dosa on the tawa for a longer time(than normal dosa) to get a crispy dosa and also the oats should get cooked well or else it might remain a bit sticky.